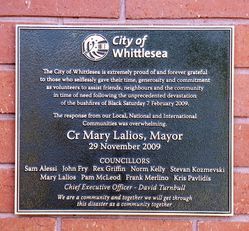 Two plaques commemorate the Black Saturday bushfires of February 2009 and remembers those who gave their time to assist those in need during the disaster. The Black Saturday bushfires were a series of bushfires that ignited or were burning across the state of Victoria on and around Saturday, 7 February 2009. 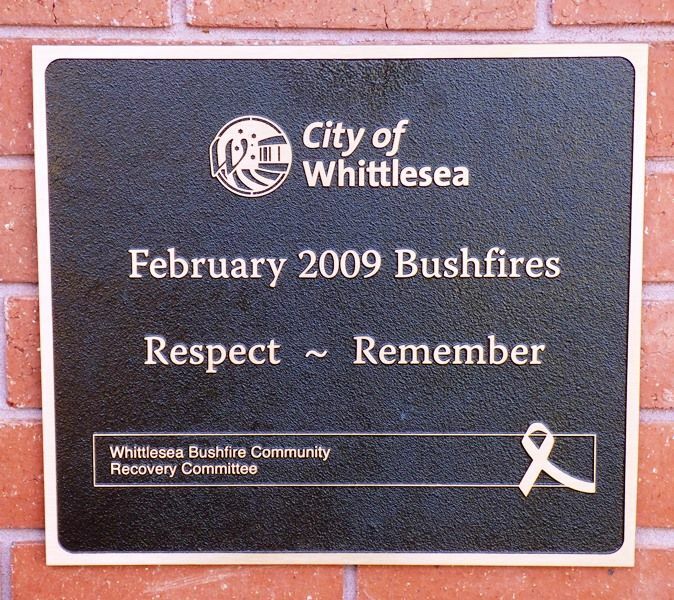 The fires occurred during extreme bushfire-weather conditions and resulted in Australia's highest ever loss of life from a bushfire; 173 people died and 414 were injured as a result of the fires. 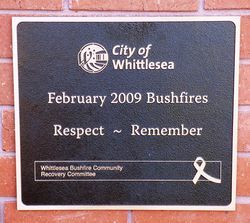 The City of Whittlesea is extremely proud of and forever grateful to those who selflessly gave their time, generosity and commitment as volunteers to assist friends, neighbours and the community in time of need following the unprecedented devastation of the bushfires of Black Saturday 7 February 2009.